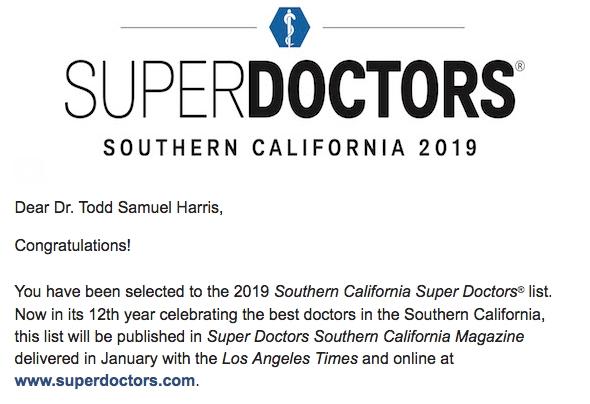 Dr. Todd S. Harris was awarded the 2014 – 2019 Southern California Super Doctors Award. Approximately 5 percent of the physicians within Southern California are named to Super Doctors (2019) and no more than 2.5 percent are named to the Rising Stars list (2014-2018)! Dr. Harris is the only hernia surgeon to have received the Rising Stars award and Super Doctors award for both the last 5 years. Rising Stars is awarded to outstanding physicians who have been fully licensed to practice medicine in their respective specialty for approximately 10 years or less. Physicians are leaders in their field and are rising through the ranks of the medical field in Southern California and nationwide. The selection process for Super Doctors is a rigorous multi-step process designed to identify healthcare providers who have attained a high degree of peer recognition and professional achievement. Super Doctors is a selective yet diverse listing of outstanding doctors, representing consumer-oriented medical specialties. (Oral and Maxillofacial surgeons from select markets are also named to the list). Survey of Doctors: First, we create a pool of candidates. Each year Super Doctors invites doctors to nominate colleagues they know to be exceptional in their specified field. They are asked to consider the following question: “If you needed medical care in one of the following specialties, which doctor would you choose?” Numerous safeguards are in place to prevent ballot manipulation and doctors may not self-nominate. Candidate Search: Our research staff also contributes to the pool of candidates by searching medical databases, online sources, and publications for providers who have attained certain credentials, honors or professional achievements – what we term ‘Star Search Credentials.’ This process also includes doctors in less visible or highly specialized medical treatment areas. Nominees are then grouped into specialties. Doctors, in each area, who have the highest scores from the nomination and evaluation steps are invited to serve on a “blue ribbon panel.” Each panelist is asked to review and evaluate a list of nominees from his/her area of focus. The last step is to total the points received from nominations, research, and blue ribbon panel review. Only the highest-scoring doctors are included on the Super Doctors list. The Super Doctors list is approximately 5% of the physicians within the respective state or region. The Final Selection: The last step is to total the points received from nominations, research, and blue ribbon panel review. Only the highest-scoring doctors are included on the Super Doctors list. The Super Doctors list is approximately 5% of the doctors within the respective state or region. Before Publishing: Each candidate is contacted to verify the doctor’s professional information. Honorees are asked to verify they have not been subject to disciplinary or criminal proceedings. The research staff also independently reviews the discipline record of each candidate before publication and verifies that the doctor is active and in good standing. The Rising Stars lists are published in a special advertising section in Los Angeles Magazine. Physicians are awarded this honor based on numerous criteria (see below) and do not pay for this recognition. To be eligible for inclusion in Rising Stars, candidates must be active and fully-licensed to practice for approximately 10 years or less. While approximately 5 percent of the doctors within the respective state or region are named to Super Doctors, no more than 2.5 percent are named to the Rising Stars list. Even if selected, a candidate’s name will not be published on the Super Doctors list unless all information is confirmed prior to publication. Licensed and active providers with a “Doctor of Medicine” degree (MD) or a “Doctor of Osteopathic Medicine” degree (DO) are eligible to register. Oral and Maxillofacial surgeons in select markets are also eligible.